With nails getting longer, more patterned and colourful sometimes it's nice to go strip everything bare and go back to basics. My mum is going on holiday tomorrow so she came to me for her Shellac rockstar toes and some waxing. I knew she wanted red glitter for her toes so I suggested Shellac's Wildfire for her fingers too. Mum isn't a big fan of her nails being 'all different' as she calls it so this is perfect. 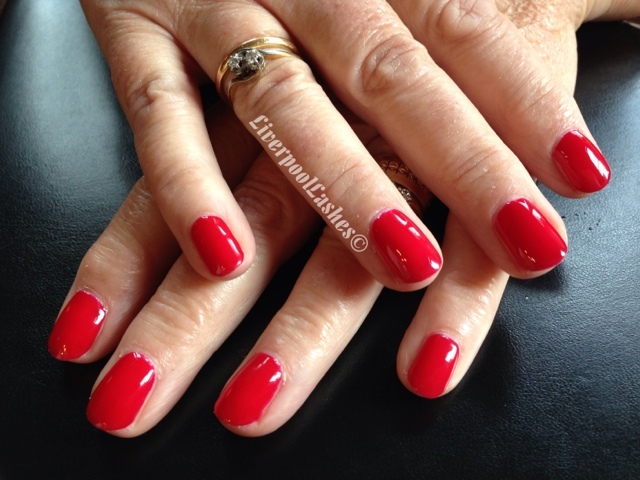 I love just simplicity of red nails. They're bright but the cream shade mean that there's no shimmer making the shine even more noticeable. I love that they will always be a classic whether it's the hottest day of summer or the darkness of winter. Personally a straight colour like this always makes me think you can see the shape of the nails better as well but I'm not sure if thats just me! I hope my parents have an amazing holiday - they're heading up to chilly Iceland !